I was really productive the past weekend - cooked, cleaned, caught up on some TV series, met my Dad and best of all, managed to slot in some DIY time! I don't know about the rest of you, but buying clothes that fit my frame properly is almost an impossible task. In fact, come to think of it, I don't think there's anything I've purchased that I would consider to 'fit me like a glove'. (This is starting to sound a lot sadder than I had originally planned). I mean, why is it that skinny jeans don't fit the way they do on Miranda Kerr or Rihanna? (Go figure). I'm not talking about looking tall or thin. My skinny jeans bunch up in odd places all over, if it fits somewhere like the waist, then it's not going to fit at the knees or length wise. My problems lie in the fit. I love the cigarette-esque look seen on Miranda Kerr but unfortunately most jeans don't do this for me. If we all have to be Victoria Secret models in order to fit into skinny jeans properly then I'm doomed for the rest of eternity. Anyway, back to my point. There's a simple reason why clothes don't fit me. I'm a pudgy Asian, below average in height. I'm talking 5ft. So, I took it upon myself to alter my jeans to fit me a bit better! 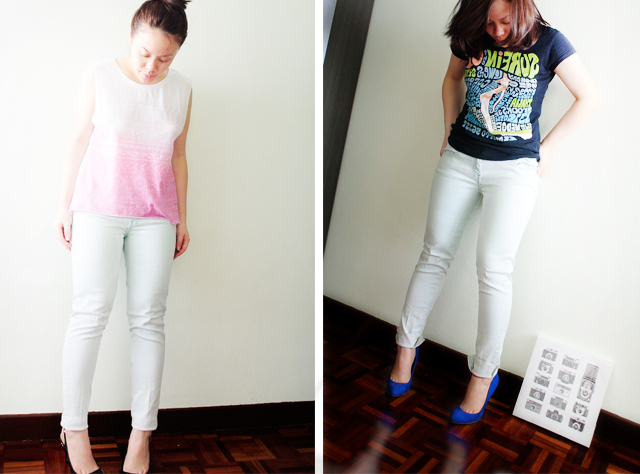 I was mostly inspired by Merrick White of Merricksart.com who came up with the clever idea of turning a wide-legged pant into skinny jeans. 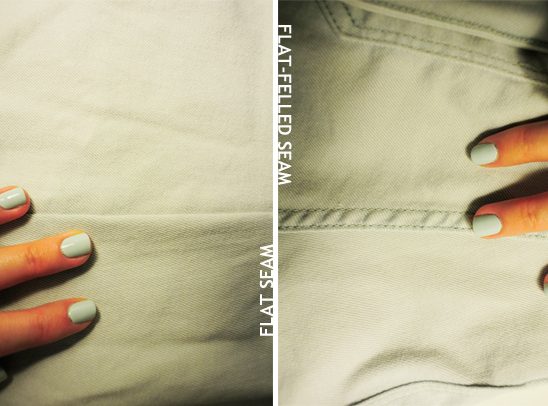 I've had this pair of Pastel/Mint Green jeans from Zara ever since pastels were in a few seasons ago. Unfortunately, I never really got around wearing it much because wearing them made me feel like one of the dwarfs from Snow White. 1. I didn't like how the extra long pockets created extra bulk around my thighs. 2. I also didn't like how it bunched up at my knees. 3. Most of all, it had a confused skinny-but-not-skinny look. And it was too long. 1. First of all, put your pants on and determine which areas you don't like (similar to what I did above). 2. Take a good look at your jeans. Be aware of which sides have flat-felled seams and which sides have flat seams. We want to make alterations only to the sides with flat seams. 3. Then, as goofy as it may sound, put your pants on upside down and again take note of areas you don't like. Ideally, the alteration should be made on the inside. 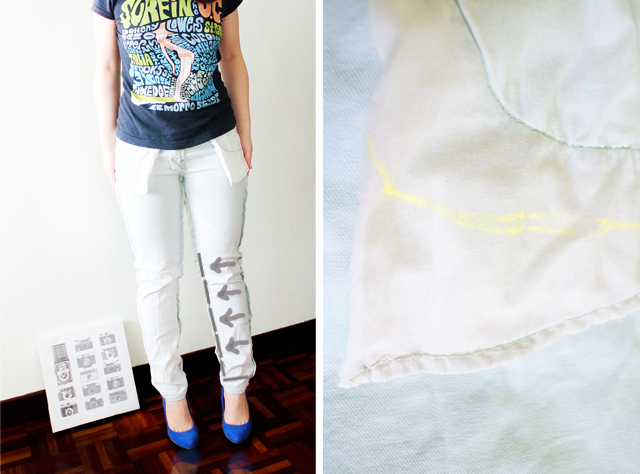 So pull the access fabric towards the inside of your pants (arrows). Once you've decided how much of your jeans needs taking in, pin the access with pins. At this point, your jeans are still upside down. I prefer my jeans slightly straight. So instead of taking it all the way in up to my ankles, I made sure there was some space at the bottom. As a result, your entire pant will look less carrot-like, and more cigarette-like! I measured the hem of another pair of jeans as a reference point. And I also took in the pockets. 4. This step is optional. After pinning, I usually prefer marking the line (from the pins) with fabric chalk to make sure that I get a straight line. 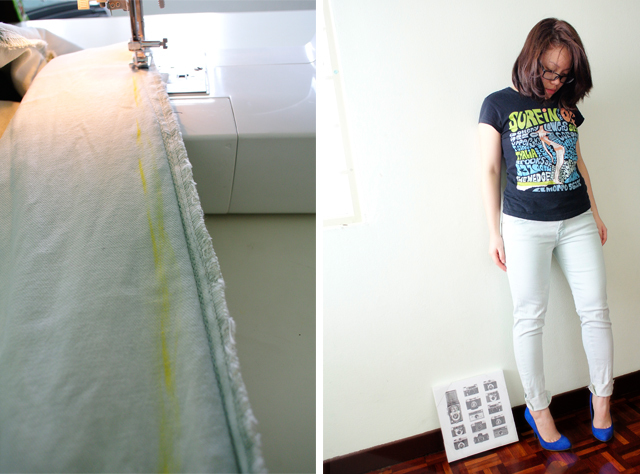 I highly recommend taking this step especially if you're new to making alterations. 5. 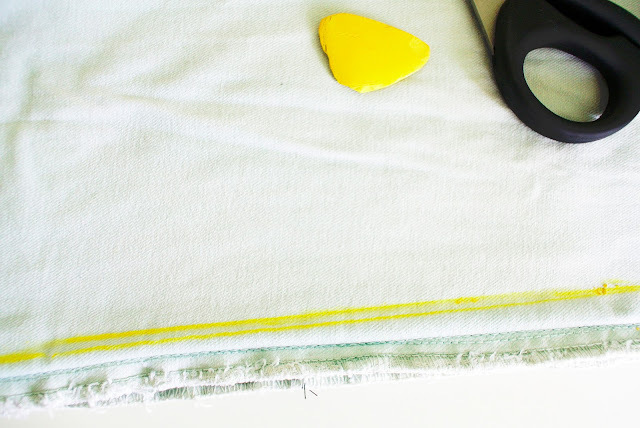 Sew down the line. Turn the pant upside down and try it on for fit. 6. Once you're happy with it, cut the access fabric and hem your jeans. 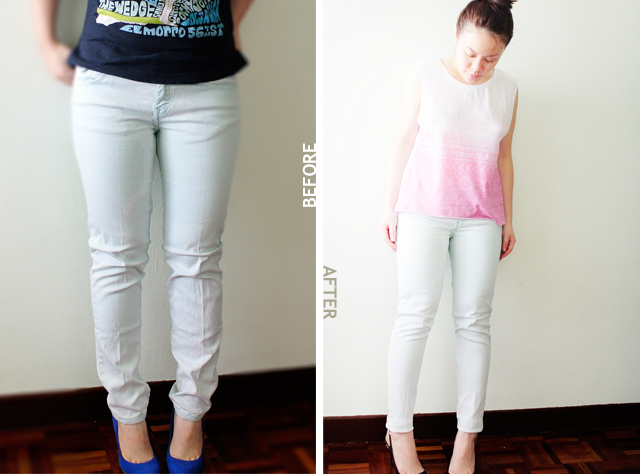 And there you have it, better fit jeans in just six simple steps! I hope you find this useful and send me your before and after pictures (to jillianundercover@gmail.com)!